Metcalfe’s Law states the value of a network is proportional to the number of members squared. I thought it’d be fun to run the numbers on the Bitcoin Network. Since we don’t have solid figures on the number of active users on the network, I’ve had to use network transactions** as a proxy to active users. The graph shows the correlation has been strong until 2015, where we’ve dipped into undervalued territory. We should be in the $40b range for market cap or $2500 per bitcoin. That seems a reasonable price target in 2017 given bitcoin’s long term trend. It’s $620 today so we have 4x to make up for. 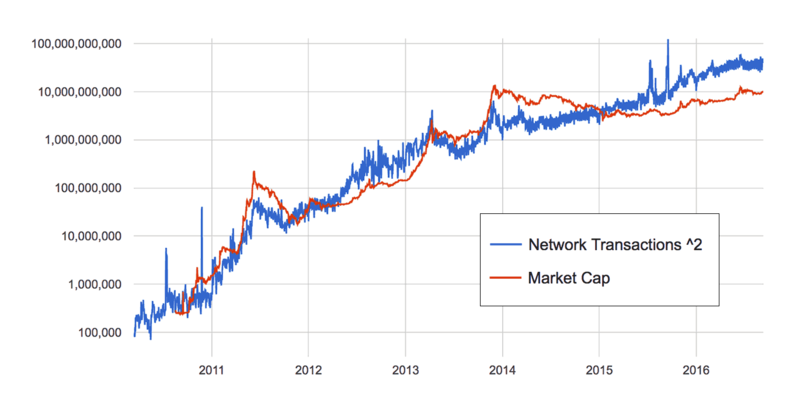 Altcoin growth exploded starting in 2015 which would stimulate extra transactions on the network as users shift between currencies. Especially with the emergence of services like ShapeShift and its integration into multi-coin wallets like Jaxx and Exodus. The utility of Bitcoin has been on a stead increase since 2014 with more merchants accepting it and remittance traffic growing by the likes of BitPesa.